(PRLEAP.COM) TAMPA, BAY, Fla. - Bay Brick Pavers (BBP) of Tampa announces the grand opening of a new showroom in the Tampa Bay-area community of Land O' Lakes. Unlike the usual warehouse-sized patio paver facilities that can overwhelm shoppers, BBP's new showroom reflects the company's signature approach to the customer personalization experience with a scaled-down retail space that accommodates an extensive inventory by incorporating paver samples on the facility's floor with displays of retaining walls and fire pits. The effect is a welcoming and customer-friendly environment featuring a wide range of premium hardscaping products for outdoor spaces including brick pavers, concrete pavers, clay pavers and thin pavers. BBP offers patio paver products in a wide range of colors, shapes, sizes, patterns and finishes to complement the home or business's exterior and landscape design. In addition to patios, Bay Brick Pavers offers paver solutions for driveways, walkways, retaining walls, pool decks, fire pits, indoor-outdoor lanais and virtually any outdoor surface area. Every BBP paver project is custom-designed to help meet the customer's aesthetic preferences, address damage and/or cosmetic flaws in existing surfaces and accommodate weight demands on certain surfaces such as driveways, retaining walls, and fire pits. An onsite consultation with a Bay Brick Pavers' professional is performed to assess the scope of the project and discuss the customer's needs and expectations. Pavers are available in a variety of types including Travertine, brick pavers, thin pavers, clay pavers, and interlocking pavers. Once the customer selects the paver size, color and pattern layout they want, the design for the project is finalized with a drawing made during the onsite consultation. 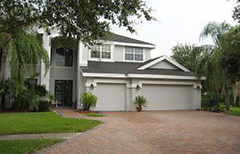 The pavers are then custom—ordered from a manufacturer local to the Tampa Bay Area. Paver installation has exacting requirements. 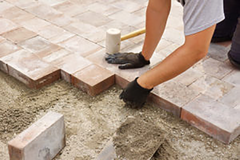 Bay Brick Pavers' team of skilled professional installers are experienced craftspeople who know how to ensure the pavers are installed properly for adequate drainage and to withstand years of heavy traffic and wear. The results include an instant boost in curb appeal and added resale value to the home or commercial property. The new Bay Brick Paver showroom, located at 3940 Lake Padgett Drive, Land O' Lakes, Florida 34639 will serve customers in Land O Lakes, as well as the nearby communities of Wesley Chapel, Lutz, Odessa and Tampa. Bay Brick Pavers' main office and showroom is located at 4508 Oak Fair Blvd. #110, Tampa, Florida, 33610 across from the Florida State Fairgrounds. To learn more, visit the Bay Brick Pavers website at https://www.baybrickpavers.com, email info@baybrickpavers.com, or call 813-850-2651. Founded in 2006 by Karen Wilson and Ted Wilson under the name Outdoor Floor Source, Bay Brick Pavers is a family-owned business serving communities throughout Hillsborough and south Pasco Counties. The company offers a selection of beautiful and durable materials, as well as products and services that cater to residents and businesses who enjoy their outdoor spaces and love the curb appeal and increased home value paver hardscapes add to their driveways, walkways, patios, pool decks and other outdoor spaces.